Ouch. It really is a new season, isn't it. 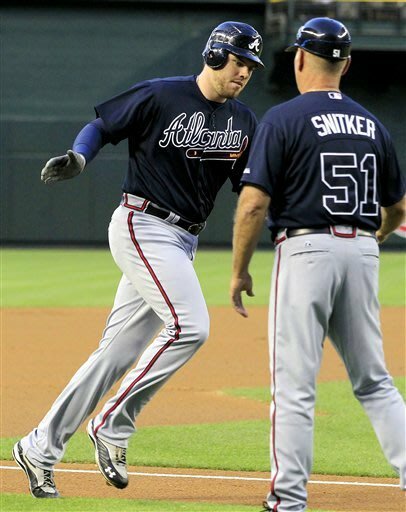 The Braves look like a talented and young team, and Josh Collmentor looked like a talented young pitcher, but he was hammered hard by Freddie Freeman and the Brave on Thursday Night. First off, Collmentor is lucky that he's still in the D-backs rotation and losing a game like this doesn't help his argument for staying with the Snakes. His delivery is a tricky thing to handle if you haven't seen it that many times since he learned to pitch by throwing axes, but once you settle down against him, all he throws is a fastball and a change-up. I'd send him to either Reno or the Bullpen so he can develop. Baseball is a harsh game and success is short lived.